Orbán, an outspoken nationalist, wants to remain in the EPP, Fidesz said on Tuesday, despite growing pressure within the European Parliament’s biggest grouping to suspend or expel it, a scenario backed by European Commission chief Jean-Claude Juncker. The Hungarian leader has long been at loggerheads with Brussels over his hardline stance on immigration and accusations – which he denies – that he is undermining the rule of law. The feud is escalating ahead of European Parliament elections in May. 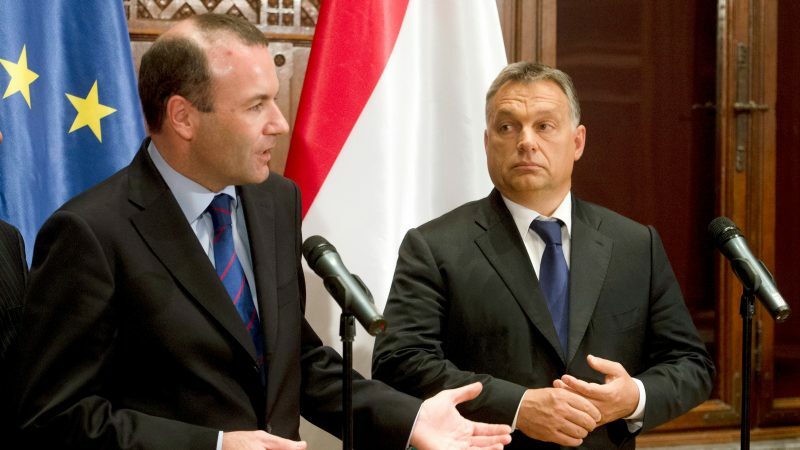 “Viktor Orbán must immediately and permanently end his government’s anti-Brussels campaigns,” Manfred Weber, the centre-right European People’s Party (EPP) candidate to be EU Commission President, told Bild newspaper. On Monday, the EPP said it had received motions from 12 member parties in nine EU countries and would discuss suspending or excluding Fidesz on 20 March. Twelve national members of the centre-right European People’s Party (EPP) have officially requested the exclusion of Hungary’s populist Prime Minister Viktor Orbán and his party Fidesz, the EPP’s leader said on Monday (4 March). Some of these parties have warned that if Fidesz remains in the EPP, they would leave the group. In the meantime, some EPP-affiliated forces voiced support for Fidesz. The Center-right Democratic Alliance of Hungarians in Romania (UDMR), an EPP member, would vote against the expulsion of Fidesz from EPP. “It would be a big loss for the EPP. During the elections campaign, many things are said, with different nuances and accents… Without Fidesz votes, the EPP might not have a majority (after the EU elections),” Kelemen Hunor, the party’s chief, told the national television TVR. EURACTIV Croatia reported that the Slovenian EPP members also opposed Fidesz’s expulsion from the EPP. The largest, the Slovenian Democratic Party and the non-parliamentary People’s Party are strongly against, while Nova Slovenija proposes freezing membership. Juncker, who in 2014 was the EPP’s candidate for the top EU executive position he now holds, accused Orbán of coming “within a hair’s breadth” of peddling falsehoods and said he would support the exclusion. 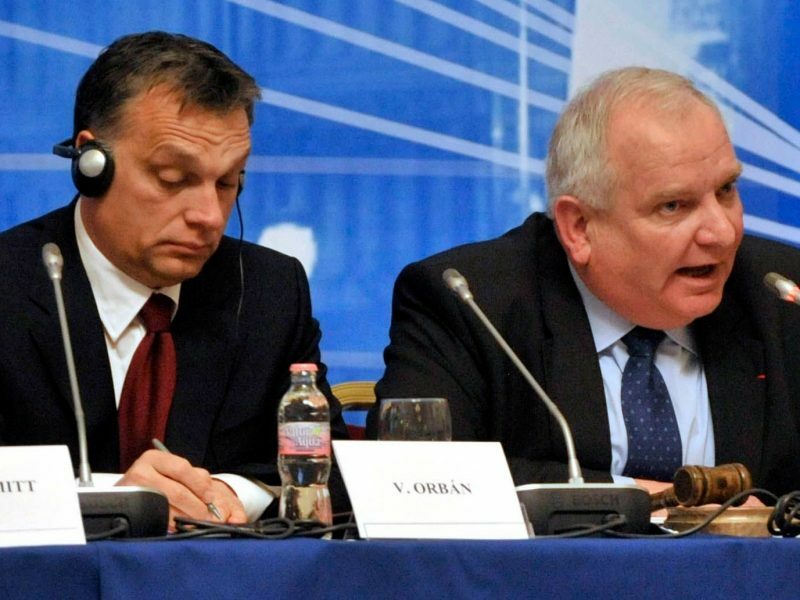 “I already said months ago that the EPP’s biggest problem in the European elections has a name, and that is Orbán. I will support this exclusion,” Juncker added. Speaking to journalists in the Germany town of Rottersdorf Weber said that in recent weeks “Viktor Orbán and the Fidesz have crossed red lines again” and added that all options were on the table, “especially the option of expulsion and going away, going our future way without Fidesz”. 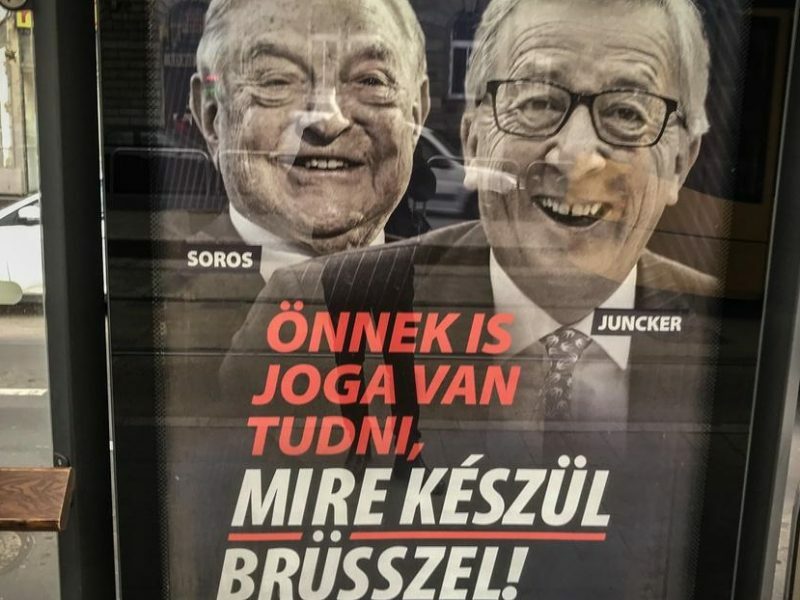 Orbán has launched a media and billboard campaign that frames the May elections as a choice between forces backing and opposing mass immigration and that attacks Juncker. Hungary’s government announced Saturday (2 March) that it would end a controversial poster campaign accusing US philanthropist George Soros and European Commission chief Jean-Claude Juncker of supporting illegal migration. “In the details, of course, we have differences of views, but far more important than these differing opinions is that this initiative be a good start to a serious and constructive dialogue on the future of Europe,” Orbán said in a statement to Reuters. Weber told Bild newspaper he expected an apology to EPP member parties, an immediate and permanent end to Orbán’s anti-EU campaigns and renewed government support for Central European University to stay in Budapest. CEU was forced out of Hungary and plans to relocate to Vienna from September as Orbán wages a bitter campaign against its founder, US billionaire George Soros, accusing him of supporting immigration to undermine Europe’s way of life. Hungarian-born Soros, 87, denies that. It appears that Weber has sympathy or supports Orban and this is under surface of the stand he has taken towards him, a stand he takes under pressure from within the EPP. Again the fear of losing numbers but is this more important than principles which one expects of the EPP if it is inspired by Christianity and its founder, the Christ? The only pressure point in the EPP is the threat of member parties quitting the EPP if Orban and his party are not expelled. Clearly a division between Western and Eastern parties. The sympathisers of Orban from Eastern Europe should themselves leave if Orban is expelled.